By CaptSpike, July 30, 2013 in Questions About Trout & Salmon Trolling? I found a chart online but I wasn't sure how accurate it is. Looking at the numbers it seems as though it would be in the ballpark. Anyway I put it in an excell sheet and saved it as a pdf. I don't know if this chart includes rings or not on the dipsey. As I said there was limited info where I found it. I believe it said it was for trolling speed of 2.2 - 2.4mph. Maybe someone recognizes the format and could shed some light on it. I think I can enter it here now but I can't delete the other thread. thanks. so how do you read this thing? i.e. the Aprox Depth column is the aprox depth and the numbers in the other columns are how much line you have out? Yes, so looking at the first column, which is a regular dipsy with wire on a 1 setting, 210 feet of wire out will get you 90 feet down. Next column over is a 2 setting and it will take 256 feet of wire to get 90 down, etc. Is the magnum dipsey a regular dipsey with the power ring? doesn't the mag dipsy just have a much heavier weight so that it has a steeper dive angle? I don't own any but that was my understanding. i dont own any either,but when i was at the tackle shop the other day buying anew dipsey(regular size) i believe is a number 1,there was a "mag" diver next to it and it was bigger. Those mags with the rings really pull. I've always used the charts that come with the dipseys in the package. They are pretty accurate with braid on my dipseys rods. Most guys say how many feet out and what setting. I always have referred to my depth on my chart. 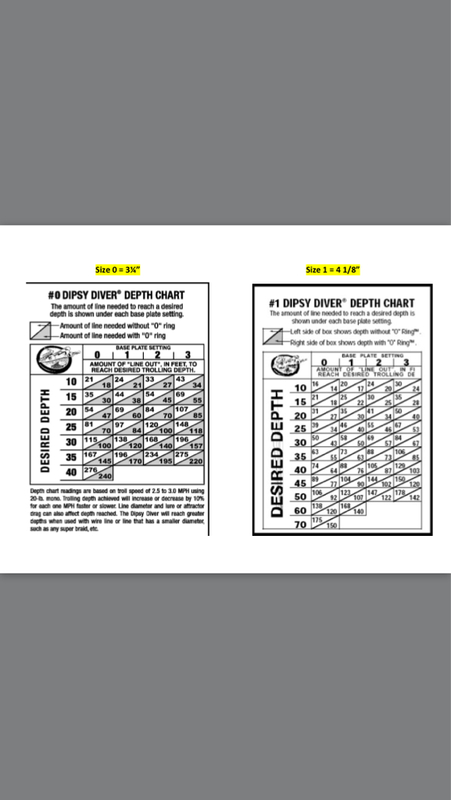 If I mark fish at 45 feet, I match that on my dipsey chart with whatever setting it's on. Maybe I'm making a mistake by doing that??? I used the size 0, 1 and mag, depending what I'm fishing for and where. The mags are great for getting down to 100 feet. I pretty much only use the size 0 in lake erie for eyes. I run them out up to around 300 feet and they run way back straight behind the boat so a steelhead would make a real mess of things. Once you get the hang of reading the charts, it's cake. I keep laminated 8.5x11 copy on my boat for quick reference. Honestly, those charts are made with 20 lb mono and are worthless for determining depth with wire or braid. I am in the process of making a Dipsy chart for the size 1. I am using the FishHawk TD sensor each time I go out. 7 strand wire. size 1 dispy with the ring on. Once I'm set up at trolling speed, I will attach the TD, and go through the settings on the Dipsy. Starting at 3 and working my way back to 1. I let it out in 10ft increments. Then reel it in. For example: 10ftâ€¦then reel inâ€¦..20ftâ€¦reel inâ€¦30ftâ€¦.reel in. 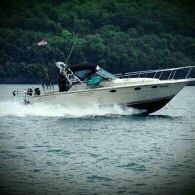 I keep doing that until I spool my reel or hit bottom. I log the depths I hit each time I reel in. My chart is coming out really nice. Once I get data for each dipsy setting Ill start playing with trolling speed and see how my numbers compare. If anyone wants a copy of my data just let me know. Super accurate. Would like to get copy see how this works out! Those of you with Smart phones, Accu-dipsey app is $1.99 I think. It covers mag, #1, #0, with or without ring, Braid, wire, mono. I use it all the time and I find it to be very accurate. Also, can define troll speed. at the Google play store. take a look. danley is a life saver! They make a leadcore App.. So far I haven't decided whether I like it or not. It hasn't proven to be as accurate as the Dipsey program. I'll let you know.